This first photo was taken in one of my stables. I have nests in all three of my stables. These are the first babies to show themselves so far, in the stables. 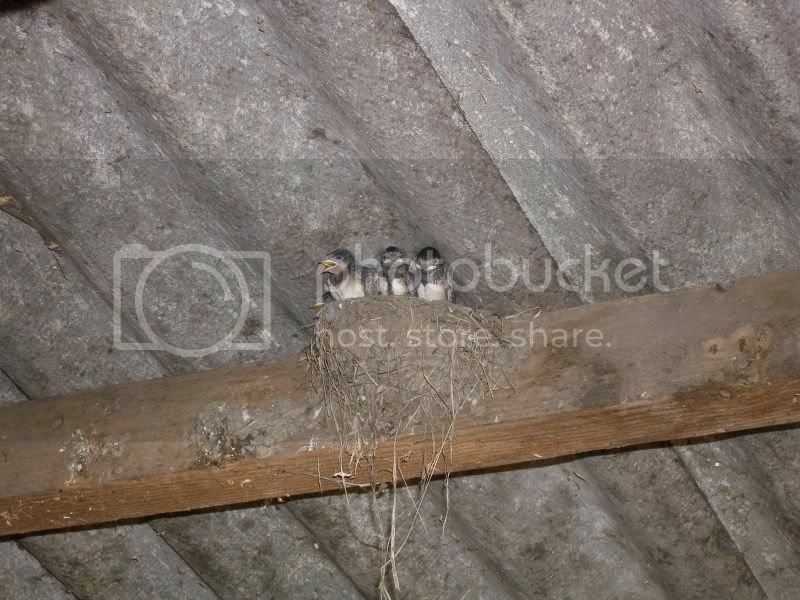 This one was taken in my hay barn. I have about 4 nests in here, so I leave the door open all summer until about end of September early October when they have all flown back to Africa. They're so sweet. I'll miss the baby swallow in the boathouse at the cottage this summer. They really are wonderful.. Poop allot though. They're sure cute, aren't they? We have baby robins and swallows darting around the houses here, and hummingbirds! You really do have to duck quite often, when going into any of my building outside.. I haven't seen any robins this year yet. Goodness but they're sweet! 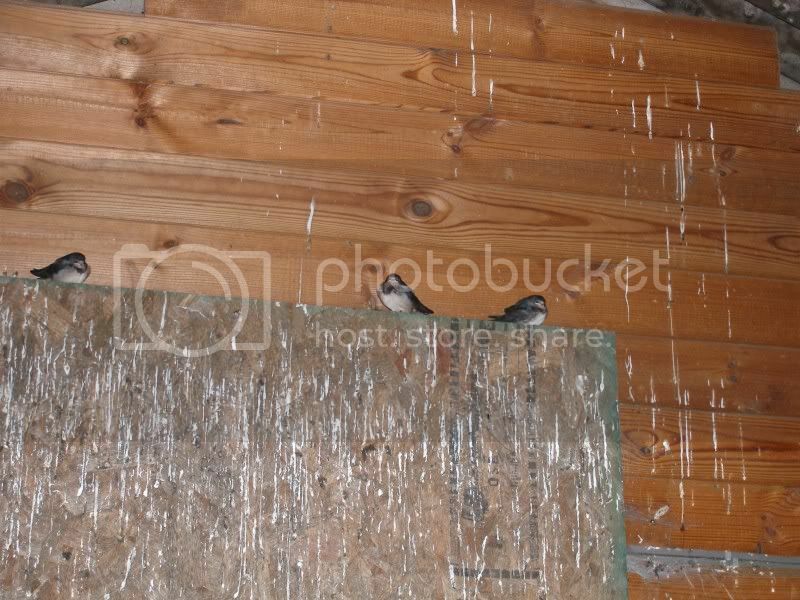 We have swallows in the barns where I work - I've got my fingers crossed that there will be the patter of little wings soon! In the latter part of the evening,I have just a cloud of house martins flying around the house before they dive into my building for the night. Wonderful! They love to chat to each other too, don't they? I just love them. They always look like they are wareing a tux, when stood like this on the edge of the nest waiting for mom and dad to feed them. And great pics... We have Purple Martins here in the mid-west, any relation?? Homes on the lake have the Purple Martin houses on top of hight poles that they make their nests in each spring. They swoop and skim the water eating bugs when the sun is going down. I love to watch them when we're fishing late in the evening. They may be related I don't know for sure. These always nest in buildings, not on the outside. I have to keep my barn door and spare stable door open from April to October in all weathers, till they have a flown. Happy Birthday Janet!!! I hope you have a lovely day. The pics of the baby birds are lovely. I just popped in to give you my good wishes, as I have been out of touch lately, what with some very complicated situations at home, plus I lost all my e-mail addresses through a computer problem last year. So good to hear from you Karen. I was thinking about you the other day and hoping you were ok.. Hope things settle down for you soon..
Maybe you will make it to the next GMOH in 2010 Birmingham again I think maybe. We have this guys!!! They are crazy funny...zipping around everywhere. SOOO CUTE. Thanks !!! ..at least they look like the crazy zippy guys I have by me. They might be the same. I always start looking around the first of April for them to come back. I have quite the flock flying around now.